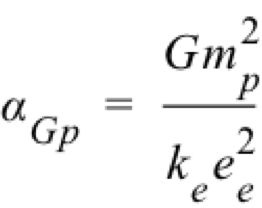 The Gravitational constant (G) was derived after deriving the gravitational coupling constants for the electron (αGe) which is explained here. Classically, the coupling constant is the ratio of gravitational force of two particle masses versus the electric force of two particle charges. But this doesn’t describe what it truly is. In wave equation format, it is explained as a slight reduction in wave amplitude at the electron’s core – the slight difference in wave amplitude between the longitudinal in-wave and longitudinal out-wave. The proposed reason for the amplitude reduction is the transfer of the energy for particle spin. This is illustrated in the next figure. The coupling constant for the electron is classically derived as the ratio of the gravitational force of two electrons to the Coulomb force of two electrons. 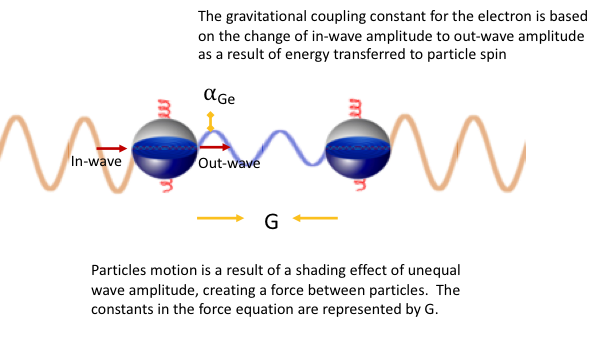 The coupling constant for the proton is classically derived similar to the electron, but replacing electron mass with the proton mass. The derivation of this constant is available in the Fundamental Physical Constants paper.